The guy with the big hair with his arm across his chest in the second picture in the United Flyte page is Jim LaRoche, a great singer, drummer and all around good guy who left United Flyte in 1976 to join Dan Burrows and me (Paul Cooper) in my band Northwest Harness Company. Dan is the older brother of Bob Burrows, and also an outstanding guitarist and harmony singer. Jim played in our band from 1976 until 1985, he left the band to work his regular job at Scott Paper when the strain of too many nights work began to interfere with the day job and kept him away from his family. 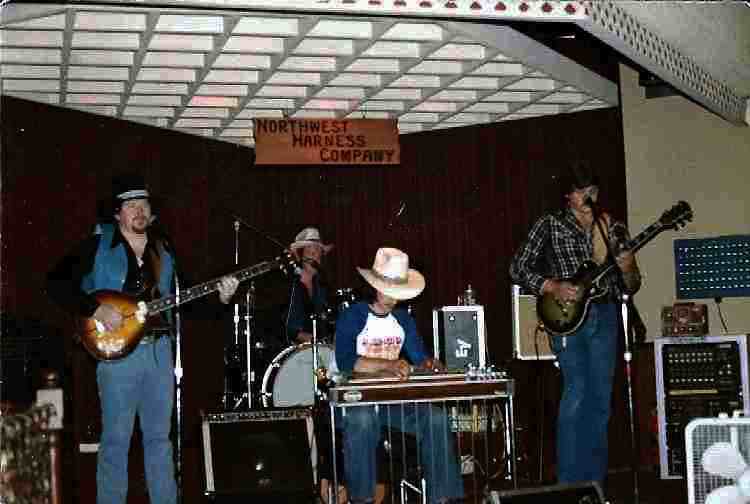 The band Northwest Harness Company formed in 1965, with me as Bassist and lead vocalist, was well known as a country-rock band, playing everything from Buck Owens to Beatles, Stones, CCR etc., to anything we felt like playing, including original songs I had written. We also performed a rock and roll revue and comedy act as Class Reunion. We built a solid reputation as a Country-rock and Blues power trio with accent on strong vocals and harmony. We soon became too much rock for our early western swing band and the rest of the guys. We owe them all credit for the roots of the band, but our public image and following was built with the following members . The Northwest Harness Company was Paul Cooper, Bruce Boyd and Steve Christianson for most of the first ten years, Paul Cooper, Jim LaRoche and Dan Burrows for most of the next ten years. We had a great twenty year run, regrouping in 1985 to perform rock and blues as Satisfier before disbanding in 1987. Some other regular and/or guest members were , Ron (Sweet-talkin' Jones) Ussery, most of the guys in United Flyte at one time or another, Drummers Gene Winslow from Young Country, Rick Johnson from Burgundy Express, Bob Cook, Steve Christianson, Danny Fenwick, Jim Berry and Ed Roy. Guitarists J.D. Hoag, Lenny Serdahl, Gene Nygaard, Bob Burrows, George Secombe, Bruce Boyd, Cliff Cook, Loren Bollinger, Larry Evans, Buffalo Bob Mowell, Kinny Alvers, Jim Peso, Bill "Dub" Barnett, Leroy Bear Medicine, Terry Davidson, and a lot of fine musicians I am sure to be overlooking. 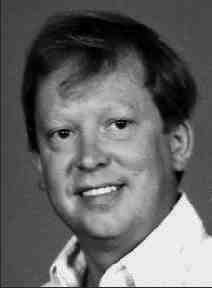 I lost a good friend and the world lost a great guitarist December 15, 2006, when Danny Neil Burrows passed away at 56. He was an incredibly talented man. In addition to his many years with Northwest Harness Company, Dan played for Axis Drive, Everyday People, Ray Brown Trio, Sky High, and several nationally known acts. He was also a great guitar teacher. More than a few talented lead guitarists started their careers as his student. Dan and I played together as The Northwest Harness Company for more than ten years. What a string of great times and great gigs. His musical talent was immeasurable. He could play a scorching rock song, follow it with incredible guitar work on a ballad that wouldn't leave a dry eye in the place, then launch into some zany tune with a hum-a-zoo as lead instrument. He would even sing the Meow-Mix ditty. I always felt it was privilege to have Dan as a friend and as a band member. His guitar and teaching skills along with Jim Laroche’s harmony arrangements helped make our band one of the busiest trios in the Northwest throughout the Seventies and Eighties. Dan was my friend for more than thirty years. His humor, his enthusiasm for fun in life, the visits to jam at my house and his goofy prank phone calls will be greatly missed. Thanks for the memories Danny. Teach the angels how to play guitar. Dan was born March 10, 1950. He entered the gates of Heaven, December 15, 2006. Dan was preceded in death by his mother, Gladys; and his father, Joseph Burrows. Dan is survived by his loving companion of fifteen years, Susan Harmon; his daughters, Erin, Danelle, Molly; his sisters, Jan, Sandy, Mary and his loving brother, Robert. Dan is also survived by his extended family of Randy, Rick, Tracy, Tom, Brenda, Frank; grandchildren, Sammie, Sydney, Alexis, Frankie and numerous nieces, nephews, grand nieces and nephews and many, many friends, all of whom brought him so much joy. Dan was an accomplished musician and teacher, who inspired all those whose lives he touched. Throughout the 1960s and 70s Dan performed as one of the founding members of the rock band "Axis Drive." Later Dan traveled throughout North America as a member of the band, "Everyday People." Throughout his musical career Dan performed with numerous well known entertainers. Dan's famous sense of humor was a constant reminder of Dan's gift for making people laugh, even in times of sadness. Dan became a legendary teller of stories, never forgetting to tell a joke of sneaking in a prank on a unsuspecting victim. Rest easy Dan: get out that guitar! You are playing with the best now. No more pain or fear. We love you. “Splish Splash (I Was Taking a Bath),” a song performed by Bobby Darin, is one of those tunes that won’t fade from favor as long as bands keep 1950’s music alive. Steven Christianson, part of the band Sky High, played old rock ’n’ roll, such as Darin hits, and country songs in the 1980s around Snohomish County bars, fairs and festivals. They could be found many Friday and Saturday nights at Sunset Tavern in Monroe or Cedar Stump in Arlington. The drummer and singer held a day job, too, until health issues changed his life. 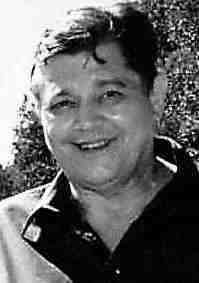 Steven Paul Christianson died May 26 in Everett from complications of diabetes. He was born Nov. 21, 1949, and was raised in the Pinehurst neighborhood. The family included four children, including Dave, Tom and Mona, who, typical of those days, rode bikes with no helmets for miles around. They shopped at C&H Variety, Walt’s Buy Rite and most everyone belonged to Degree of Honor. His brother, Tom Christianson, also a musician, said their dad, Benjamin, was a carpenter, and their mother, Pauline, was a school cook for many years at several campuses. The family had a cabin at Flowing Lake in Snohomish, where summers were a blast, he said. The youngsters hung out with friends around the lake. Steve Christianson owned a hydroplane he zoomed from shore to shore. He bought a waterski at Wigwam. The gang caught bullfrogs at night. 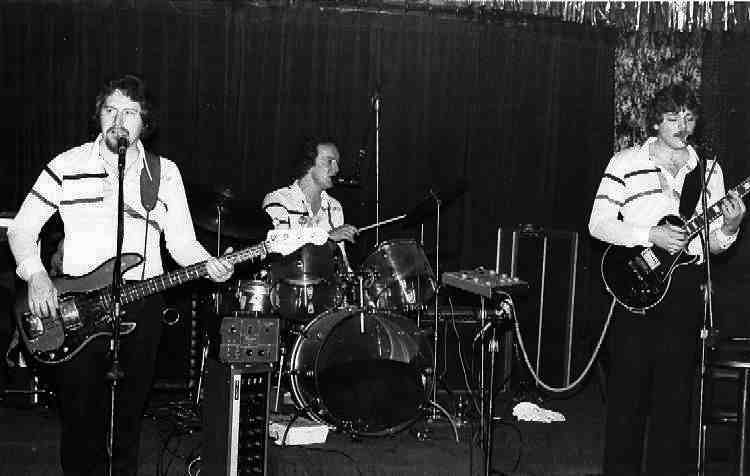 Steve Christianson’s first band was called Turncoats, formed in the mid-1960s. They practiced in the basement of the Christianson home. He still played 1950’s and 1960’s music with adult bands. After playing dates in Everett, Christianson would order sweet-and-sour pork at China Doll. He wore Western shirts and tennis shoes. His friend, Phil Mitchell, sat in with Sky High when the regular bass player was unavailable. The musician was a kind man, said his sister-in-law, Jeanna Christianson. Her brother-in-law used to tell friends and family he planned to move to Nashville to make it big. Steve Christianson worked by day in the grocery store business, including a job at Tradewell, and was a retail clerk for 25 years. He fell through a roof and hit his head while remodeling a friend’s home near Stanwood, which began a downhill slide of health issues. He was preceded in death by his parents, Benjamin and Pauline Christianson; his brother, Loren Christianson; and niece, Heather Marsh. He is survived by his brothers, Dave and his wife, Sue, and Tom Christianson and his wife, Jeanna; his sister, Mona Reed and her husband, Marty; his children, Rob Christianson, Brian Christianson, Brandi Christianson Varnell and Stephanie Christianson; and eleven grandchildren. His son, Brian Christianson, said his family enjoyed fishing, camping and spending time at Flowing Lake. Brian Christianson remembers peering through tavern doors to watch his father play in bands. He bragged to a young girl, while his father played at a fair, that the drummer was his dad, but the girl didn’t believe the youngster. When they were camping, his father would play tapes of Sky High music. Bruce was an excellent guitarist and singer and for many years my good friend and musical mentor. We formed the band Northwest Harness Company together back in the Sixties. Bruce left the band in 1975 to follow his religious convictions. I will always appreciate his immense talent and the great times we had through all those years. Bruce and I talked infrequently over the years, before finally losing touch completely due to my busy schedule. I just learned of his passing. God bless you friend. You will be missed and remembered fondly. I know that our list of players looks like we had a huge turnover of personnel, but many were added to the basic trio as featured players for a specific job or period of time. Most of the drummers were fill-ins during vacations, holiday breaks, 2 honeymoons, etc., when first Steve Christianson in our earlier years, then later on Jim LaRoche (who played for me nearly 10 years), each needed time off. Most of the drummers were borrowed from other great bands for whatever period of time we could get them. I left out an old friend the talented drummer and blues singer Steve Potter from Breezy and Bounty Hunter bands. Pretty much the same with guitarists. Bruce Boyd replaced Bill "Dub" Barnett in 1967 stepping from rhythm up to lead guitar. Bruce played about seven years, then we went through several excellent guitarists over the next year looking for someone with the versatility of styles and vocals we needed to keep the power trio country, rock and blues sound we had established. We found Danny Burrows to be a perfect fit and he played for the next 10 years. All the other players were with us for periods of time and large venues that required additional pieces. We had excellent keyboard players Fred Cook (Smoking hot B-3), Rick Lewis (Billy Joel sound and vocals) and Bill "Billy Clay" Miller (Elvis and Jerry Lee all rolled into one). I failed to mention the great pedal steel guitar players who added to our sound along the way. Ray Shively, Jerry Forcier, Wimpy Jenkins, Jim Webb, Jim Peso (Pedal Steel, Sax, Lead guitar, Keyboards and Vocals) and Kinny Alvers (Lead guitar and Pedal Steel) were the best steel guitar players in the business when we were able to feature them in our shows. Since our band was built around strong vocals and harmony, all guitarists, keyboards, Sax and drummers were also lead or backup vocalists. The only exceptions were steel players Ray, Jerry, Wimpy and Jim Webb. These guys made their instruments sing. We also had three female vocalists among all these guys Kathy Stickley, Pam Alvers and the late Paymela Faye Long. We performed on the same bill or as backup band with Nashville Artists; Dave Dudley, Red Simpson, Buddy Allen, Glen Barber, The Canadian Sweethearts, Johnny Paycheck, Alan and David Frizell, Ferlin Huskey, Ernest Tubb, Little Jimmy Dickens, Del Reeves, and Mel Street plus a few more I must have forgotten. We also did shows with pop, rock and blues artists Johnny Tillitson, John Edward Beland, Cody Bearpaw from Redbone, Albert King, Elvin Bishop, and Dianne Schurr. I am honored to have had the opportunity and pleasure of performing with all of the extremely talented people who shared our stage over all those years. When Steve Christianson passed away another really good person as well as an amazing talent was lost to us. Steve was my friend for over thirty years and my drummer for nearly ten years. We hired him while he was still in high school to play in The Northwest Harness Company. He was at the time playing British Style rock with the Turncoats, and the drummer in the award awarding Cascade High School Jazz and Stage Band. A kid with a flashy double-bass drum set that screamed "look at me!" and it didn't take a second look to see he had all the talent needed to back it up. Steve took to the night life and entertaining like a fish takes to water. He was constantly working to improve his skills, learning to play and sing any style required. He stayed with us until the demands of a young and growing family prevented him from keeping up our very busy schedule. To have more control of his work schedule, Steve went on to form his own bands, most notably Sky High a talented, well rounded group of musicians that were well liked throughout King, Snohomish and Skagit counties. Steve had a lot of health issues near the end of his life that prevented his performing, but he never lost his enthusiasm and love for music. He was always in touch with old friends, and kept the most positive attitude and cheerfulness in the face of his illness. A dear friend who will indeed be missed. Another sudden and tragic loss of a friend and fellow musician occurred when Steve's brother, Dave Christianson, passed away only five days after his younger brother's memorial service. Dave was a singer and rhythm guitarist and friend to many musicians. He was the original owner of Arlington Music and longtime host of the weekly jam sessions held in his store. Another good guy, I guess it runs in their family. My dad, Ben Van Wormer sang and played rhythm guitar for the band in the early days. The line up at the time included Dub, Leroy, Paul, Bill Miller on piano, and no drummer at the time. Bruce Boyd and his brother Cameron were good family friends of ours. We all played in our original Western Swing band "The Wild Wild West" (about 1964 and '65). We had an open door policy ala Asleep at The Wheel. If you could pick or sing and showed up for the gig you were in. If you left to play for another band, you were always welcomed back. We gathered at Dub Barnett's place next door to Ben Van Wormer's place and had some huge jam sessions when no paying gigs were available. The talent pool we shared was incredible at the time. The ever growing band was soon too big to book into the small venues and we were forced to split into two to three groups to play full-time. I led The Northwest Harness Company. Bill Miller started his own group and traveled as The Billy Clay Show before settling down andopening his own Billy Bob's Bar and Grill in Marysville. Dub played in several more groups over the years before retiring in Arizona. Dub was a Journeyman Ironworker and was free to travel and play anywhere. He invited me to join the union and I brought Ben Van Wormer into the trade where we met Bill Miller and he joined the band too. 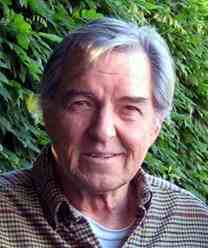 Bill Miller - Born 1941 passed away on 22 December 2011. Bill was an outstanding performer who could cover many artists’ songs as well as the original artist did them. Whether it was Elvis, Jerry Lee Lewis, Mickey Gilley, Ray Price, Fats Domino, Hank Snow, Ernest Tubb, etc. , you would think you were hearing the "real deal". Bill was truly the real deal in everything I ever knew him to do. I always knew he would deliver not only the best he could do, but always do even more than expected. I didn’t see him often over the past few years, but whenever we did it was always a pleasant and humorous conversation, with a few shared stories of our intertwined past. Goodbye friend. Show them how to rock those pearly gates Texas style. Bill "Dub" Barnett was born 23 September 1934 and passed away 2 February 2012. Knowing Bill "Dub" Barnett as a young boy had a great influence on my entire life. Dub gave me the opportunity and the confidence to become a full-time professional musician, hiring me to be front man in his band when I was still pretty young. When it came time to travel, he convinced me to quit a steady, but dead-end job and become a Journeyman Ironworker. Those two opportunities became my lifetime careers, and made my life more rewarding, and lived to the fullest. I have retired from both music and construction, but what a wonderful journey. I have never forgotten my, friend, my mentor, and the one who set me on the path that led me through an incredible journey called life. God bless you Dub, I am eternally grateful to have known you.